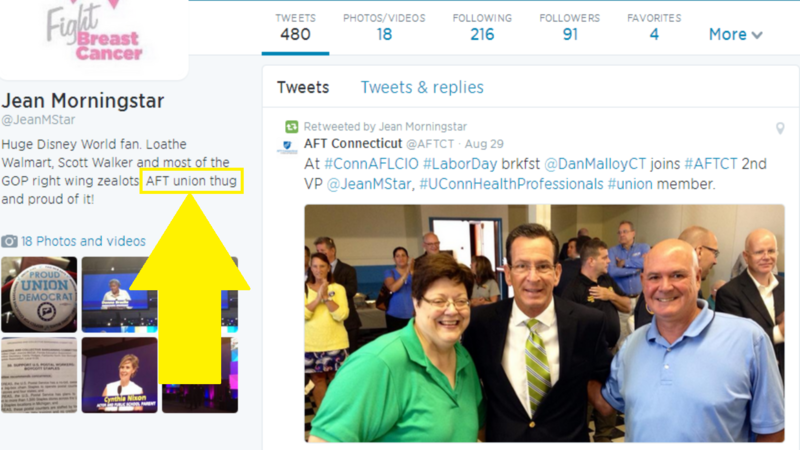 A Connecticut teachers’ union official who holds an appointed position in state government calls herself a “union thug and proud of it” on her Twitter page. Jean Morningstar is second vice president of the American Federation of Teachers Connecticut. Gov. Dannel Malloy appointed her to serve on the State Contracting Standards Board last year. 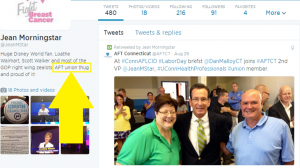 A recent tweet included a picture of Morningstar posing with Malloy. After a fight over education reform including proposed changes to teacher tenure, Malloy and AFT have grown close again. Malloy and AFT national President Randi Weingarten are expected Friday to tour schools together in Meriden and New Haven. Last month, Malloy appointed Erin Benham, one of 22 AFT Connecticut vice presidents, to the State Board of Education. In 2012, Malloy appointed Sharon Palmer, then president of AFT Connecticut, to serve as labor commissioner. Loathing most of the GOP right wing zealots says volumes… one can disagree with an individual’s politics but to profess a deep hatred for individuals based on rightfully held beliefs is a bit odd coming from the left which makes claims to being so very tolerant. She was being ironic. Must have gone over your head.